It’s been a whopping four weeks since Microsoft flighted a new Windows 10 Insider build. Given the software giant normally rolls out new builds on a weekly basis, it’s been a long wait for Build 17063 to arrive, but a wait that’s definitely been worth it. Microsoft said this was an important build, and one it wanted to get right. It’s easy to see why. There are new features, and big changes galore throughout. The standout new feature in this build is the introduction of Timeline. Originally intended to be part of the Fall Creators Update, but dropped when it became clear it was never going to be ready in time (pun intended), the feature is described as introducing "a new way to resume past activities you started on this PC, other Windows PCs, and iOS/Android devices." Timeline shows snapshots of past activity (apps you were using, and tasks you were working on) and lets you carry on from where you left off. 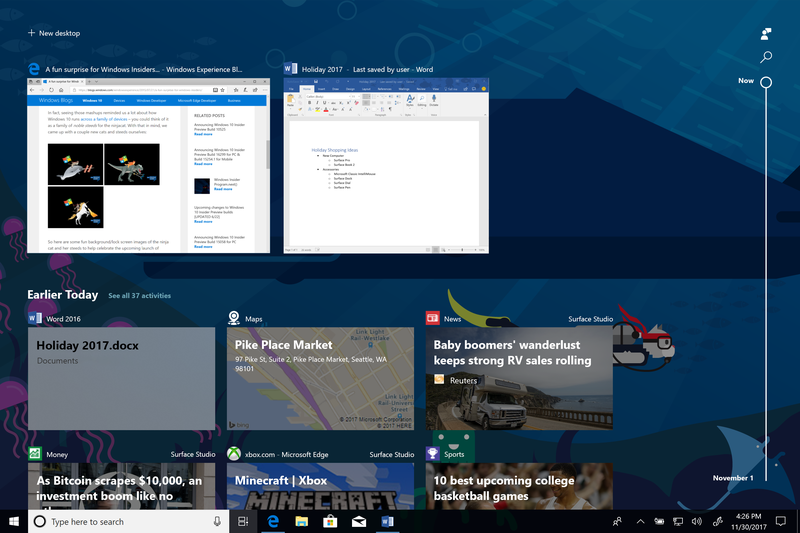 Timeline will work with a lot of apps when it arrives in the next big feature release but for now you can use it to resume web-browsing in Microsoft Edge, and carry on working in files in Microsoft Office and updated UWP versions of Maps, News, Money, Sports, and Weather. A new Activity History Settings page allows you to configure which accounts appear in Timeline, and Cortana can now suggest activities you might like to resume. Sets is another big addition in this build. The new feature groups together everything -- relevant webpages, research documents, necessary files and applications -- that relate to a specific task. While this is an exciting new inclusion, you may not have access to it, as it’s being introduced as part of a "controlled study". If you do get to try it out, let us know what you think of the feature in the comments below. In addition to those new features, there’s the inevitable collection of Edge enhancements. These include an updated Dark theme, and Fluent design tweaks. Adding and managing bookmarks for EPUB and PDF books has been improved, and there’s support for working offline on some sites, and better push notifications. The Web Media Extensions package, which adds support for open-source formats (OGG Vorbis and Theora) and was originally an optional addition, is now included as standard. This build also adds gesture improvements for Precision Touch Pads. Cortana’s Notebook has been given a makeover, and Cortana Collections have been merged with Lists. You can now use Cortana to control music playback on more of your favorite music apps, although this feature is only available for EN-US users at the moment. Start and Action Center already support acrylic, part of Microsoft’s Fluent design system, and the acrylic look has now been applied to the taskbar, Share UI, Clock & Calendar flyout, Network flyout, Volume flyout, and Input flyout. Tweaks have been made to OneDrive files and folders on demand, and the My People feature has evolved and now allows for drag and drop rearranging, the ability to add up to 10 people to the taskbar (up from the default three), and animations for people in the overflow. The Snipping Tool gains an "edit in Paint 3D" button, and Settings gets a new look (hello Fluent). Scaling has been improved to help overcome the issue of blurry apps, there’s a new Keyboard Settings page, improved Region & Language Settings, better Data Usage Management, the ability to reset Game Mode Settings, and improvements to Windows Defender. There are numerous updates to input as well. The Windows Subsystem for Linux (WSL) can now run background tasks, elevated and non-elevated WSL instances can run simultaneously, and WSL is now supported when connected via OpenSSH, VPN, Enter-PSSession, and so on. There's also a new tool to convert Linux paths to Windows-friendly ones. It's not all good news though. From this build, and going forward, Microsoft is beginning to retire HomeGroup. The sharing feature is no longer viewed as being relevant in this day and age. Fixed an issue where all types of dynamic volumes (listed here) wouldn’t mount properly or be accessible from Windows (the data remained intact but inaccessible on the volume on impacted builds). Fixed an issue resulting in potentially not receiving all of your notifications from Cortana in the last first flights. Fixed an issue where when using Windows in Hebrew no search results were shown in Search until a space was entered. Fixed an issue where if the system was low on memory context menus might display in a narrow width, missing all text. Fixed an issue that could result in an error message saying "device does not respond" when attempting to use Near Share. Added a top level link to Storage Settings to "free up space" now, so you can get at it faster if you need it, rather than having to open Storage Sense first. Made some small tweaks to the design of the Windows Update Settings page and subpages. Updated the touch keyboard to now have an animation when invoking and dismissing. Updated the wide touch keyboard such that if you double tap the Shift key to turn on caps lock the key will now stay in a visual pressed state so you can see that caps lock is engaged. Made some small design changes to the dictation UI that appears when you press WIN+H. Microsoft Edge may not receive Push Notifications from websites in this flight, due to an issue saving permissions on a per-site basis. Microsoft expects this issue to be resolved in the next preview build. If you’re using any EUDC fonts Microsoft Edge, Cortana, and other apps that use a webview won’t launch. You can resolve this issue by deleting the HKCU\EUDC key in Registry Editor. Note, if you do this, you won’t be able to see EUDC characters. Microsoft recommends you export this regkey before deleting it, so it’s easy to reapply the key in a future flight once the issue has been fixed. After upgrading to this build you may find touch and pen to not work on the non-primary display. Related to this, mouse, touch, and pen input might not happen in the right place after an orientation change or if you’re using a non-native aspect ratio.